Apart from over - indulging in wives, Henry VIII was also a glutton, favouring 14 course banquets prepared by his 200 kitchen staff. Amongst the bizarre items on the menu were grilled beavers' tails, whole roasted peacocks, internal organs (although not of his wives!) and whale meat. Vegetables also featured, but not to excess, as they were viewed as the food of the poor. Cully & Sully love food. Growing up in Ireland's foodie capital, Cork, they ate a lot of good food, Cully (the cook) knows that for good food you need great ingredients. They also love business (well Sully does!!). 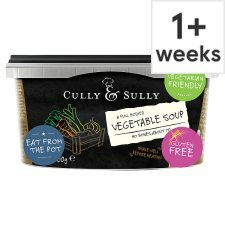 The business of making good, honest & tasty foods is what Cully & Sully do best! Make some root vegetable crisps and float them on the soup. Use a potato peeler to peel thin strips of potato, carrot, parsnip or beetroot. Fry them in about 1 cm of nice olive oil until crisp. Drain on some kitchen paper and sprinkle with salt. Remove lid and place loosely on the top of the tub. Heat at 800W for 2 minutes. Remove and stir. Put back in for a further 2 minutes. Leave to stand for 1 minute.